After the two stroke era which was led by Yamaha, it was Hero which gave us the taste of first blood in the form of CBZ and then Karizma – both of which can easily be termed as icons of performance motorcycling in India back then! However, they could not capitalise on that and the scenario after 10-15 years tells us the complete story – Hero MotoCorp is the lowest seller in the 200 cc segment and is among the least sellers in the 150 cc segment (despite the presence of 4 odd motorcycle models!). A recknoner of how bad things have gone – their Hunk and Xtreme are vying for the top spot in lowest sales in 150ccs, Karizma R and ZMR are officially dead! Post the break-up with Honda, Hero (MotoCorp) gained a new name and inked collaborations with Eric Buell Racing and others. Their Auto Expo 2014 concept models like HX250R, Hastur, turbocharged diesel TNT etc blew everybody away but sadly things have so far failed to reach anywhere close to production. The only officially confirmed production-ready motorcycle in the 200 cc space is the Xtreme 200S which was unveiled at the 2016 Auto Expo. At the Auto Expo press conference, Hero officially announced that Xtreme 200S will be launched sometime next year in 2017 (they added “for sure before the next Auto Expo (which is in 2018)“, so all those portals who were claiming its launch in 2016 were unaware! In a latest update, Economic Times reports that 200cc Xtreme 200S is lined up for launch in early 2018! If this goes true, we may have another delayed launch from the company. Xtreme 200S, when launched, will become the flagship ‘Xtreme’ in the lineup. Hero currently sells the regular Xtreme and Xtreme Sports in the 150 cc segment. Xtreme 200S is powered by a 200 cc air-cooled, single cylinder, carburetted engine which churns out 18.6 PS of peak power and 17.2 Nm of maximum torque. This is an all-new indigenous engine developed by Hero and the third one they have unleashed till now for motorcycles. The other two are – the recently launched 110 cc engine of Splendor iSmart 110 and the yet-to-be-launched 250 cc motor of HX250. When compared with Xtreme Sports, there is a marginal 3 odd bhp power increase but a near 5 Nm of torque increment. When we talk about performance, Hero claims a top speed of 120 kmph for the 200S as compared to 107 kmph of Xtreme Sports. However, when we take the segment as a whole, the Xtreme 200S fails to make a very solid impression, at least in terms of on-paper specs. Among 200 ccs, it churns out the lowest power output, least torque and has the lowest (claimed) top speed! You can check out out Top Speed Comparison of 200cc Motorcycles here. Transmission duties are administered by a 5 speed manual gearbox. Most of the other motorcycles in this segment sport 6-speed gearboxes. In terms of features it gets a rear mono-suspension, rear disc brake, diamond type chassis and LED lights. 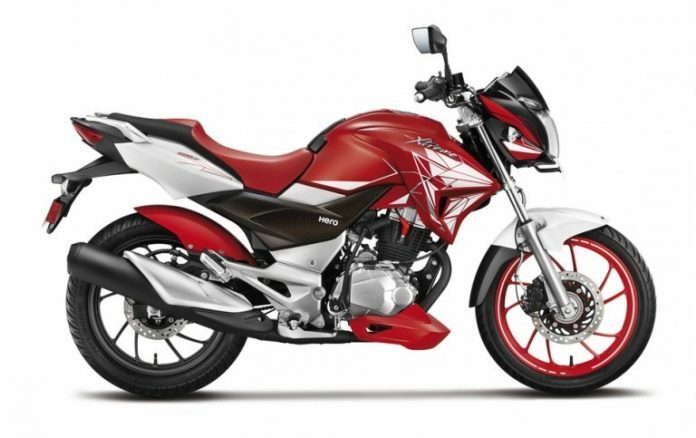 But the most important bit – Hero has officially announced that Xtreme 200S will come with ABS. The only other 200 cc motorcycle which comes with ABS is Pulsar RS200 (single-channel) as TVS, despite all the promises, has not been able to offer ABS as well as FI on its Apache 200 even after a year. The showcased motorcycle was a production-ready product at least from the looks of it. But it appears that the testing of the engine is left which is why Hero may take such a long time to launch it here. HID Xenon Projector Lighting for Motorcycles; All You Need to Know!